As forecast here last week, top-rating BBC thriller Bodyguard will premiere in NZ on Netflix. Deadline reports it will stream the Jed (Line of Duty) Mercurio hit in territories outside the UK and Ireland from October 24 while The Guardian reported overnight that Netflix picked up the rights to Bodyguard before it was filmed but its involvement was only announced yesterday. “The deal for Bodyguard, produced by World Productions, an ITV Studios company, was made through Netflix’s co-licensing team,” Deadline says. The digital platform has been a partner since the show’s early production stages. Under its co-licensing model, Netflix is collaborating with U.S. studios and international production companies on series that air on other linear or digital networks. Netflix takes first-run global distribution in as many territories as available, coming in as a partner on projects that are going to series at a finished script or pilot stage and as early as script development. 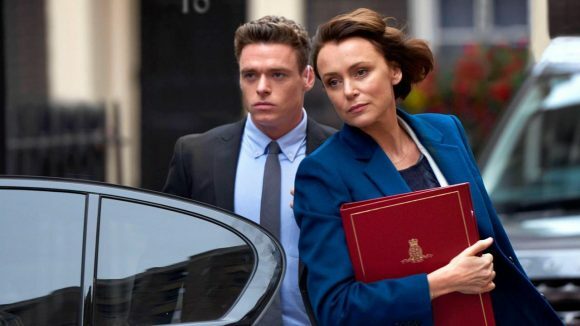 Bodyguard rated higher than any other new drama across all UK channels in a decade and so far has averaged eight million viewers overnight. Netflix also will stream another BBC series, the Rwandan genocide drama Black Earth Rising, and the Toni Collette drama Wanderlust. Already on the platform through this arrangement are the BBC’s Requiem, Collateral, The Last Kingdom, Dirk Gently’s Holistic Detective Agency and Troy: Fall of a City as well as Channel 4’s The End of the F*cking World. Pending are the animated Watership Down and, from Humans creator Joe Barton, the Japanese sleuth drama Kiri/Haji, which is slated for next year. For more on how British broadcasters are funding UK drama with global budgets, see this Radio Times report.